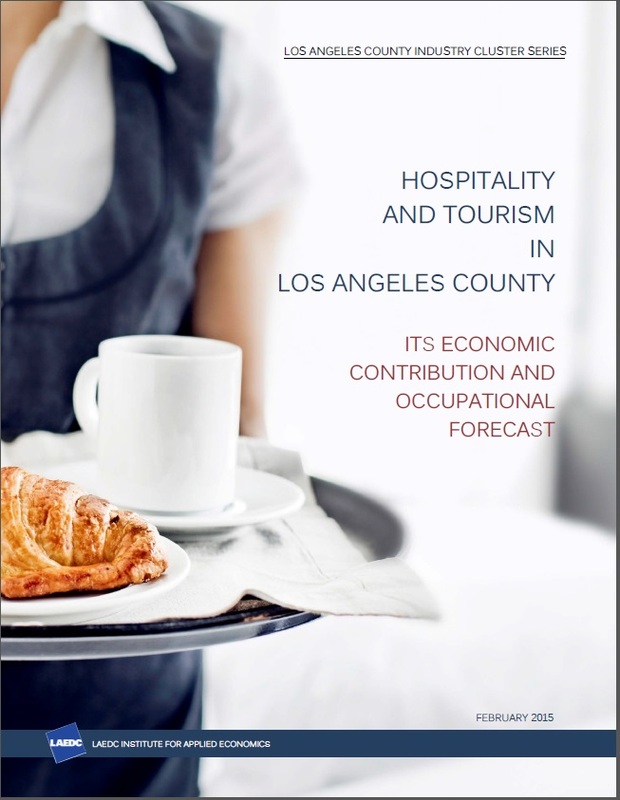 The LAEDC Institute for Applied Economics has published a study on occupations and economic impact of the hospitality and tourism industry in L.A. County, the first in a series of industry cluster studies. These studies provide essential data so that leaders and stakeholders can evaluate how to best allocate scare resources as we support and grow jobs in our export-oriented industry clusters of our region. Additionally, workforce data allows individuals to consider career paths. Los Angeles, CA, February 18, 2015 — The Los Angeles County Economic Development Corporation (LAEDC) today released a study analyzing the economic contribution and employment of the tourism and hospitality industry cluster in Los Angeles County. This study is the first in a series of reports that the LAEDC will be issuing on the Los Angeles region’s leading “export-oriented” industry clusters. Authored by the LAEDC Institute for Applied Economics, this research was made possible through the very generous support of JPMorgan Chase & Co. The region is on track to greet 50 million visitors a year, and these visitors spent more than $18 billion in our economy this year. At the same time, the hospitality and tourism industry also serves our 10 million local residents. Accordingly, the report delineates the two separate components (traded versus local-serving), which are very different in terms of their composition, workforce needs, intermediate purchases and economic impacts — distinctions that have clear implications for how policymakers and stakeholders formulate programs to encourage not only more jobs but also better-paying jobs. This industry cluster was responsible for 6.1 percent of the County’s GDP in 2013. Just over a year ago, JPMorgan Chase announced a $10 million, five-year commitment toward workforce readiness and demand-driven training in Los Angeles, as part of its unprecedented five-year, $250 million global New Skills at Work initiative. This and future LAEDC studies will be critical to guiding this initiative with informed intelligence about the regional economy’s leading industries, labor markets and higher-wage growth occupations. “JPMorgan Chase made this investment because, again and again, our business clients from around the globe, and locally here in Los Angeles, have been telling us that they’re struggling to find job applicants with the skills they need to fill their positions. This is especially true for middle-skills jobs such as computer technology, nursing and highly technical manufacturing,” said Antonio Manning, head of Corporate Responsibility for JPMorgan Chase in Greater Los Angeles. “As a major employer ourselves, we do extensive training in customer service, computer skills and financial products and services, and we realize that our connection to this issue gives us a unique vantage point on what employers are experiencing.